Relationships with clients, team members, and partners are at the heart of care management. This four-module course teaches care managers how to succeed as part of a team no matter what type of organization or care setting they work in. Join the Interest List OR Register Now! The Relationship Building online course includes two modules that focus on building strong and effective relationships with clients including the important skills needed to engage and activate them. The course also features a module on identifying and building relationships with community partners to create a strong and multifaceted network to meet each member’s holistic needs. The Relationship Building for Case Managers course has been pre-approved by the Commission for Case Manager Certification (CCMC) to provide 10 hours continuing education credit to Certified Case Managers (CCMs). Care Excellence courses are designed to give you exactly what you need, when you need it. The Relationship Building course is part of the Foundational series and designed to help you build skills you will find applicable in working with clients, patients, and team members. Please give us a call us if you want to purchase multiple modules or if you need assistance designing a custom combination of solutions. Explore interdisciplinary collaboration techniques to develop and support client care plans. Gain skills in identifying key team members, approaches for collaboration, communication,and leading team meetings. Effective care managers are able to foster strong relationships with clients, built upon a foundation of respect and trust. This module teaches care managers ways to leverage their own self-awareness and utilize interprofessional skills to build trust and engage clients in the care planning process. Care managers will learn active listening, proactive communication, and how to effectively acknowledge client emotional responses. It concludes by providing a process to help clients identify problems and set goals. Research has demonstrated that achieving health and wellness goals depends upon a strong community network of partners working together to address the social determinants of health. For example, individuals who lack access to reliable or safe transportation are less likely to make follow-up appointments with care providers. This module explores strategies for identifying community partners – both public and private sector organizations – in order to meet the needs of clients. Opportunities for developing and achieving mutually beneficial partnership goals will be described, including examples of successful partnerships. It concludes with a discussion regarding the use of joint taskforces to develop resources that benefit clients. Research demonstrates that when patients are activated – that is fully engaged in managing their own health care – they are more likely to achieve their care goals. Activated patients have the knowledge, skills, and willingness to become full participants in their care plan development and implementation. 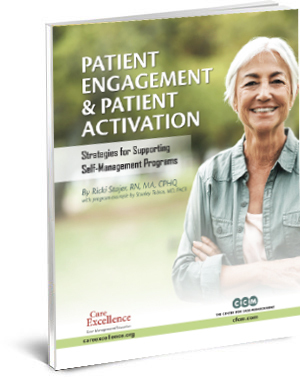 This essential module explores patient activations, focusing on client roles in the process, opportunities to improve client knowledge, skills, and confidence, cultivating client self-advocacy, and promoting long-term empowerment and resilience. Please contact us if you want to purchase multiple modules or if you need assistance designing a custom combination of solutions.